Posted: June 10, 2011 in national ID, NIST, NSTIC, Real ID, Washington D.C.
NSTIC is a proposal for a national identity ecosystem. The issue of national identity is certainly settled for some interests surveying the new NOI green paper released yesterday from the Dept. of Commerce. “There’s a new central hub and unless done properly your ID provider knows your date of birth and potentially every other piece of information along with your transaction history,” says IdentityFinder’s, Aaron Titus. The better question identity frontmen are asking is how is it not a national ID? Answers to this question today seemed more of a spooky apparition at the 2011 NSTIC workshop, hosted by NIST through Friday. Concerns about the ability to mine and sell information byproducts from the identity ecosystem remained unanswered and were treated as comments by NIST moderator, Jeremy Grant. Governance- a gelatinous term used by corporations and powerful NGO’s- was clarified by Grant in intital remarks for the workshop. Examples of enmeshed public identity exchanges presented were NACHA’s administration of government-based electronic funds transfers and a Smart Grid proposal for energy conservation and evaluations. Identity Ecosystem Consortium organizer, Kaliya Hamlin, then called for definition to the broad issue of “trust”; which has distinctions over the public and private sector for NSTIC. The jury is apparently still out. Breakout sessions this afternoon absorbed legal, technology and policy infrastructure analysts to determine the pecking order of NIST’s developing steering groups. With privacy concerns hanging so heavily in air, one had to wonder whether a privacy advocate’s appearance would be treated as an endorsement or as an effete stakeholder as part of the steering committee processes. “I don’t think it would be endorsement in this context. It feels far from endorsement. There’s a lot of real, technical stuff going on here that matters,” said Lee Tien, an EFF attorney towards relevance in NSTIC’s steering group. A diplomatic appearance from a very nervous ACLU counsel, Jay Stanley, resulted in a pointed threat level comparison of national ID programs to “the nuclear bomb”of American civil liberties. Stanley left the podium with “campaign or not to campaign against” as the question between terms of privacy and the NSTIC proposal. The Obama Administration’s priorities are reputedly low towards Real ID, the U.S.’ current national ID card program. That may be due to recent efforts to achieve similar ends in successive backdoor public-private programs hinging on involuntary data collection: the RIDE initiative, biometric worker ID cards and NSTIC, a universal online identifier compared to OpenID. The first privacy centric workshop for the NSTIC proposal is scheduled June 27& 28th at MIT. You can review today’s workshop archives here. Posted: March 28, 2011 in big brother, CCTV, surveillance, Washington D.C.
Posted: September 30, 2010 in FBI, Huffington Post, Washington D.C. 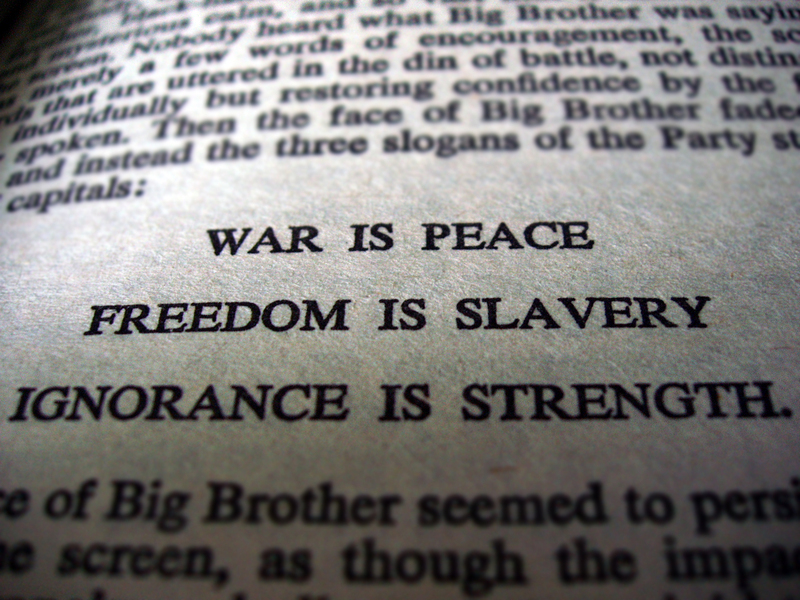 This week on Waking Up Orwell…. The station, in an ambitious 4 day effort to install a new programming board and equipment, is still in its testing stages and was automated through the broadcast scheduled for 9/29/2010. This gives us an additional week to upgrade graphics, develop the website and come up with ways to promote the show. THIS WEEKS NEWS: This about sums the national state of affairs pertaining to civil liberty this week. This weeks bid for sanity is to add your public comments about the Dept. Homeland Security’s request to for exemption from legal conditions set by the ECPA or Electronic Privacy Act of 1974 to monitor e-mail, phone calls, and anything else that creates a record from an electronic pulse. *Big Thanks to Lady Axxiom for throwing this out there. Public Knowledge about ECPA, COICA and a return to the days of the “clipper chip” with special guest, Art Brodsky. Jessica Sundin for the Minnesota Anti-war Committee tells us what it’s like when the FBI raids you when they HAVE a warrent. More news about “improper” FBI conduct. Tony Fish reverse engineers the properties of a digital footprint towards the body of online reputation. Posted: April 15, 2010 in biometrics, broad based coalitions, national ID, Washington D.C.
Posted: August 1, 2009 in ACLU, national ID, Real ID Act of 2005, Repeal Travel ID, Washington D.C. In a welcome move, legislation was introduced in the House of Representatives to repeal the discredited Real ID Act of 2005. The REAL ID Repeal and Identification Security Enhancement Act of 2009, introduced by Representative Steve Cohen (D-TN), would repeal Real ID and replace it with the original negotiated rulemaking process passed by Congress as part of the 9/11 Commission recommendations. Twenty-five states have already rejected Real ID, citing its high cost, invasiveness and the bureaucratic hassles it creates for citizens. Fifteen states have passed binding legislation prohibiting participation in the Real ID program: Alaska, Arizona, Georgia, Idaho, Louisiana, Maine, Minnesota, Montana, New Hampshire, Oklahoma, South Carolina, Virginia, Washington, Oregon, and Missouri. Ten other states have enacted resolutions in opposition to Real ID: Arkansas, Colorado, Hawaii, Illinois, Missouri, Nebraska, Nevada, North Dakota, South Dakota and Tennessee. Similar to the Akaka-Sununu Senate bill of 2007 and the Allen House bill of 2007, Rep. Cohen’s bill would eliminate most of the requirements that laid the foundation for a National ID card, such as the obligation that all data and systems be standardized. The proposal also requires a collaborative approach, called negotiated rulemaking, which would advise the Department of Homeland Security on how to maximize driver’s license security while minimizing the administrative burden on the states. This approach was initially adopted by the law which implemented the 9/11 Commission recommendations and subsequently repealed by Real ID. Significant privacy protections in the proposal include prohibiting the use of license data by third parties, encryption of the data and adherence to state privacy laws that may provide greater protection. Additionally, Rep. Cohen’s bill would also provide for the establishment of a negotiated rulemaking committee, which would present its recommendations to the Department of Homeland Security. Posted: July 20, 2009 in Arizona, biometrics, government spending, Real ID Act of 2005, RFID, TX, Vermont, Washington D.C. But with advances in tracking technologies coming at an ever-faster rate, critics say, it won’t be long before governments could be able to identify and track anyone in real time, 24-7, from a cafe in Paris to the shores of California. On June 1, it became mandatory for Americans entering the United States by land or sea from Canada, Mexico, Bermuda and the Caribbean to present identity documents embedded with RFID tags, though conventional passports remain valid until they expire.Among new options are the chipped “e-passport,” and the new, electronic PASS card — credit-card sized, with the bearer’s digital photograph and a chip that can be scanned through a pocket, backpack or purse from 30 feet. Alternatively, travelers can use “enhanced” driver’s licenses embedded with RFID tags now being issued in some border states: Washington, Vermont, Michigan and New York. Texas and Arizona have entered into agreements with the federal government to offer chipped licenses, and the U.S. Department of Homeland Security has recommended expansion to non-border states. Kansas and Florida officials have received DHS briefings on the licenses, agency records show. Such assurances don’t persuade those who liken RFID-embedded documents to barcodes with antennas and contend they create risks to privacy that far outweigh the technology’s heralded benefits. They warn it will actually enable identity thieves, stalkers and other criminals to commit “contactless” crimes against victims who won’t immediately know they’ve been violated.